Pink denim cropped jacket. Skirt sold separately. Model is wearing a size small. Light blue washed cropped denim jacket. Model is wearing a size small. White double breasted denim jacket with snap buttons. Model is wearing a size small. Denim jacket with bleach spray detail and silver grommets. Model is wearing a size small. Double breasted, fitted lightweight Spring jacket. Model is wearing a size small. 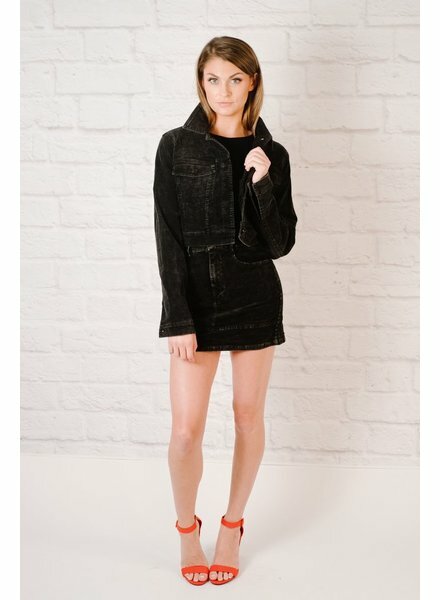 Washed black cropped corduroy jacket with black button down front. Matching skirt sold seperately. Modedl is wearing a size small.